Latent means “hidden”. It is contrasted with “sensible” heat. Sensible heat is the type which we can ‘feel’ or sense in terms of temperature. Bodies become hotter when they absorb heat energy, just as water warms up in sunlight. On the other hand, when water at 100˚C is converted to steam at 100˚ C, (no change of temperature, a large amount of heat is absorbed in this process. This is called latent heat of steam. This type of state change often involves much more latent heat energy than the sensible heat energy required to raise temperature. For example, latent heat of steam (for a given mass) is about 137 times the sensible heat needed to raise the temperature of the same mass of water through 1˚ C.
Water as a medium of storage has the limitation that its normal boiling point is only 100˚ C. At Solar reserve’s Solar Two facility, a typical site, a mixture of Sodium nitrate and potassium nitrate having a melting point of 238˚ C and can be safely heated to 566˚C. It is circulated through pipes in a heat exchanger heated by concentrated solar power in a central tower. The heated liquid is stored in an insulated storage tank till it is required for generating power. With minimal losses the liquid is available for making steam at temperatures above 538˚ C.
When required the hot liquid is routed through a heat exchanger in the steam generator, where it gives up heat and returns to a cold tank. Throughout the process it remains in liquid state with a viscosity similar to that of water (easy flow). The cooled liquid is again routed to the CSP tower for heating. Operating a turbine at that high temperature means a thermal efficiency close to 40% can be obtained. Length of the salt loop must be minimized to avoid freezing. 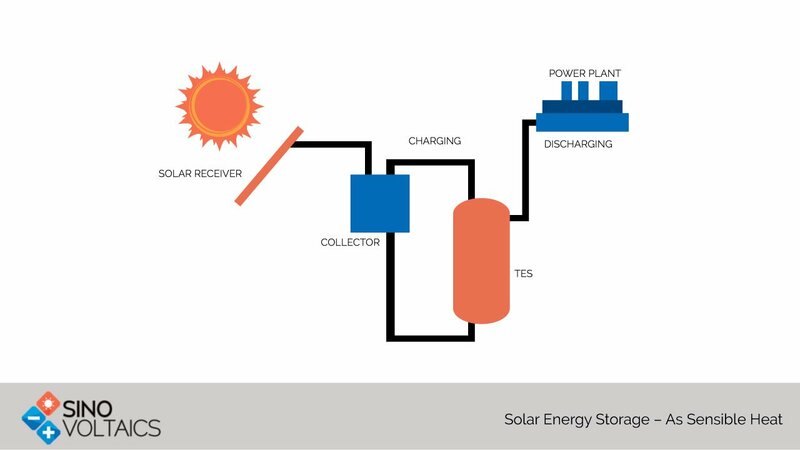 Alternate systems use a second working fluid to carry heat from solar troughs the storage, and from the storage to generation. Such systems cannot raise the fluid to a high temperature are less efficient. Solid or molten silicon can go to much higher temperatures than salts. As a result, it offers greater capacity and efficiency. Silicon is attracting research investigation. Hot water storage for daily use is now a standard practice in homes and community centers. Water can store energy both in latent and sensible heat forms. Although superheated steam can store a lot of latent energy, safety and insulation are a consideration. Water can also store energy as ice in the form of latent heat, which can be used for cooling. Interestingly, this method is still used for cooling where electric air conditioning is not available. Hot water can also be stored in caves which become natural reservoirs. This method has been found promising in experiments conducted in Scandinavia. It may seem strange, but is practical. Although water can store nearly three times the sensible heat stored by concrete, concrete can be heated to much higher temperatures. Thus, concrete structures, stone crush, even rock mass, can be used to store excess solar energy for use at night. Insulation is a concern, but when solar heat or excess PV is being stored the system becomes viable. Germany and Netherland seems to be leading in this type of storage. Both latent and sensible heat are stored in in “steam accumulators” which are high pressure tanks containing superheated steam and water. Pumped Heat Electrical Storage (PHES) means to use available electrical energy to pump heat up the hot storage tank at 12 bar and 500˚C while pumping cold down the lower temperature tank say at about -160˚C and ambient pressure. Reversing the gas flow will make most of the energy available for conversion to electrical power by a heat engine. Energy efficiency between 70 to 80 % is expected. The heat storage material in the Isentropic prototype is gravel in insulated steel tanks able to withstand 12 bar pressure at 500˚C. The heat transfer is by means of a monoatomic gas like Argon (heats more for less pressure rise).